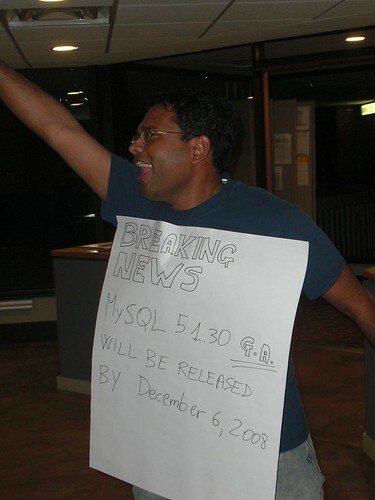 I suspect that few of the readers of my blog have missed it, but MySQL 5.1 is GA. And I suspect it was no surprise to my readers, nor those of Giuseppe, the Community Team Lead. Nor those who read Sheeri's blog, with the picture of Dups unmistakably setting GA date expectations at the OpenSQL Camp a number of weeks ago. In addition to our communication, there has been some, ehmm, complementary communication on MySQL 5.1 GA, its history, its quality, and its timing. Some of that may have been a tad one-sided, painting the world in a bit darker colours than absolutely needed. As an outside observer, it may be hard to read properly between the lines, and interpret what's really going on behind the scenes. Now, Giuseppe has made all that quite a bit easier with his fresh posting.